Snowflake’s patented multi-cluster, shared data architecture makes it possible to support any scale of data, workload, and users. Its innovative approach to supporting both semi-structured and structured data in a single system makes it ideal for combining data in one location. Times are changing. When you want to build a data lake, you don’t have to compromise having an enterprise data warehouse too. Snowflake Data Sharing is by far the simplest method for sharing data between organizations. Take an in-depth look at how Data Sharing works in this solution brief, and see how other organizations are taking advantage of Data Sharing today. When you are looking for an alternative to Hadoop, turn to Snowflake. Snowflake requires no software stack to certify, provision, and maintain. Snowflake also provides a single, robust ANSI SQL environment, that is ACID-compliant, to query all of your diverse data. Learn more in our solution brief. Our customers work with Cloud Analytics, and we help them lead their work more efficiently in the cloud and with Snowflake. ...we have been working with Cloud Analytics since 2013 and have the deepest knowledge of architecture, deployment, optimization and management in the Nordics. This will help our customers to improve their performance, scalability, operations and cost effectiveness in the cloud. 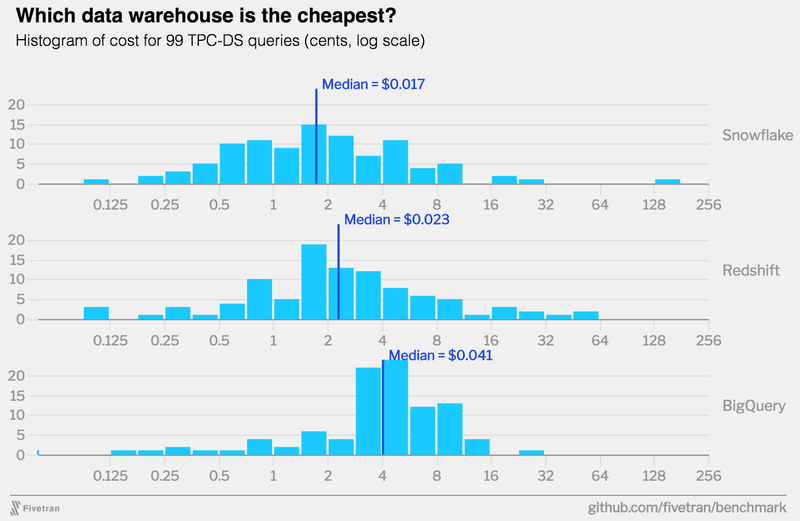 Read the TPC-DS benchmark from Fivetran, a standard data warehouse benchmark that includes a lot of complicated queries.